Whether your clientele celebrates Christmas, Hanukah, Kwanzaa, or another winter holiday, now is a great time of the year to express your appreciation to your elderly clients and their families for their trust in your agency to provide quality in-home care. While organizing a holiday “thanks” campaign may seem like a major undertaking during the already stressful holiday season, with the help of a management tool like home care software or a home care system from ClearCare, the task can actually be completed with ease. Post a Note of Thanks: For a quick communication, consider using the family room feature in ClearCare Online’s home care software and home care system to post a note of thanks for family members monitoring the care of their loved ones. This quick communication portal integrated with your home care software can make quick work of expressing appreciation and wishes for a happy holiday season. Send a Card: Cards are a thoughtful holiday tradition, and with easy to print mailing labels for clients and caregivers that can be produced right within ClearCare Online’s home care software, you can save time addressing envelopes – and maybe have a card signing party in the office! Drop By: Scheduling a time to meet with clients and their loved ones during the holidays to review service, say thanks and drop off a token of your appreciation – like a bag of Hershey’s kisses, or a small potted plant, can make a big impact. 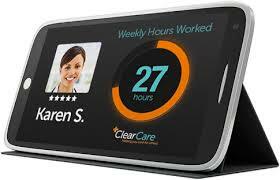 Using your home care software or home care system to schedule these appointments makes managing your calendar a breeze. Use Caregivers as Elves: Your caregivers interact with your clients everyday. Use this opportunity to have caregivers hand deliver a small gift or note of appreciation. You can use the messaging features within ClearCare Online’s home care software to quickly get in touch with caregivers and ask them to swing by the office to pick up their deliveries to take along to upcoming shifts. The holidays are as good a time as any to reach out and say thank you to your clients for entrusting you with their care. And, with the help of a home care software or home care system, like ClearCare Online, saying “Thanks!” can be easier than ever.